The image below is brought to us courtesy of bjearwicke over at Stock Exchange. Sure, we could just go in and blur the bejesus out of the offending pieces, but it is nice to have other alternatives available and perhaps we need to preserve something in the background as a reference point to where and when the image was taken. You can use this technique on animals, objects, scenery etc., it is not just limited to people. So lets get on with it. Open the image and duplicate the b/ground layer. 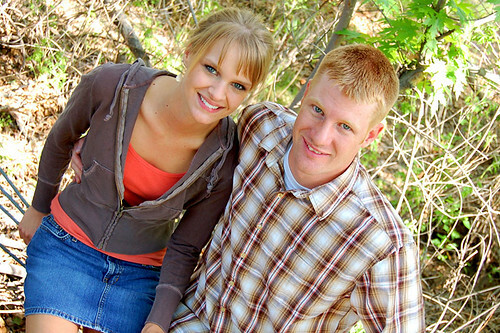 You are going to have to select the couple. You can do this in a variety of ways, I used the green channel, dragged it to the create new channel at the bottom of the channel palette, inverted it and then selected the couple by painting them with white. Normally you would take a fair bit of care to get the selection pretty right in the first. 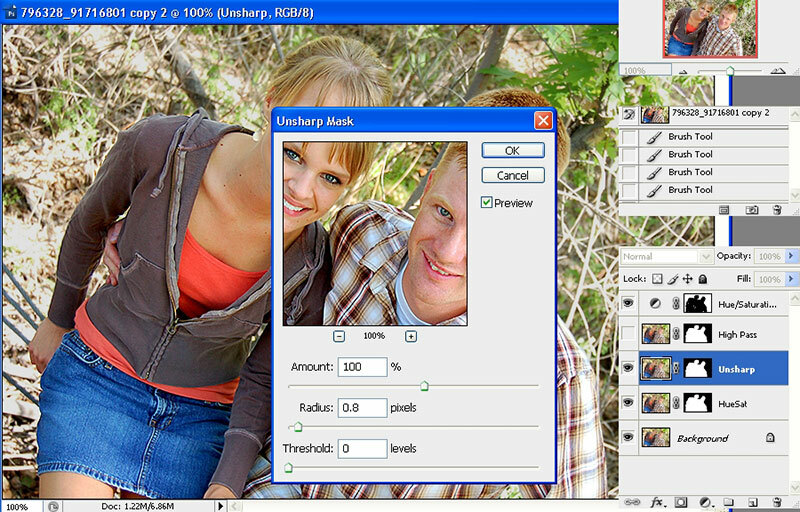 I was a bit sloppy with mine because I know that I can fix it inside the layers later on 🙂 If you’ve gone the channel route to select the couple, hold down the Ctrl key on the keyboard and click on the Cahnnel – this will load it. 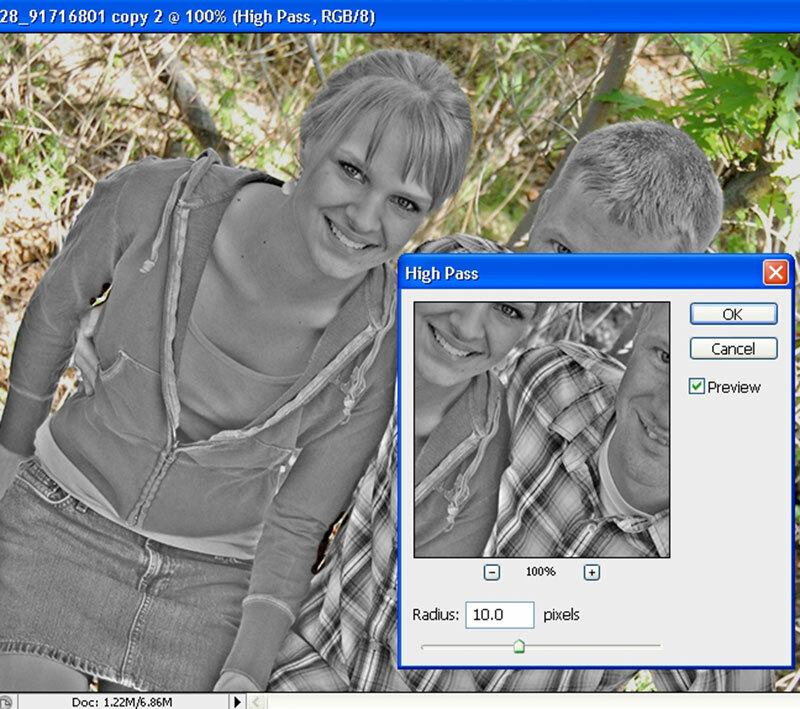 Click on RGB in the channels, then go back to the layers palette, add a mask to the background copy layer, and your selection will automatically become masked. Duplicate the masked layer twice and then hide the top 2 layers. You can rename the background copy layer Hue/Sat if you like. The next layer up the stack ‘unsharp’ and the top layer ‘high pass’ Click on the Hue/Sat layer to make it active and click on the ying yang layer at the bottom of the layers palette to create a new adjustment layer and choose Hue/Sat from the menu. You can punch in the numbers I have below or if you are working on a different image you’ll have to choose your own. The first thing you are going to notice once you click OK to accept the changes is that the whole layer has been desaturated and that isn’t what we want to happen. Hold down the Alt key and drag the layer mask from the layer below (hue/sat), and place it over the layer mask of the hue/sat adjustment layer then release the mouse. 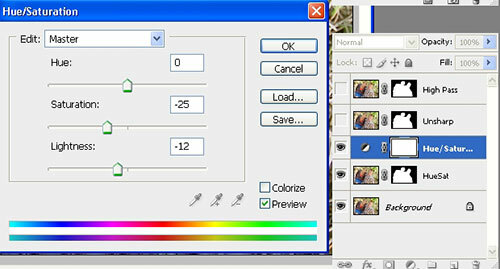 A small dialogue box will come up that asks if you would like to replace the layer mask, click OK to do that. You should find that the couple have been desaturated, click on the layer mask and press Ctrl + i on your keyboard to invert the mask. the background should now be desaturated a little bit. If you need to do any repairs to your selection, this would be a good time. Once you have it as you like drag the hue/sat adjustment layer to the top of the layer stack. Click on the layer – not the mask – called unsharp to make it active and go to Filter>Sharpen>Unsharp Mask and you can punch in the same numbers I have below it you are working on this image and then change the blend mode of the layer to luminosity. 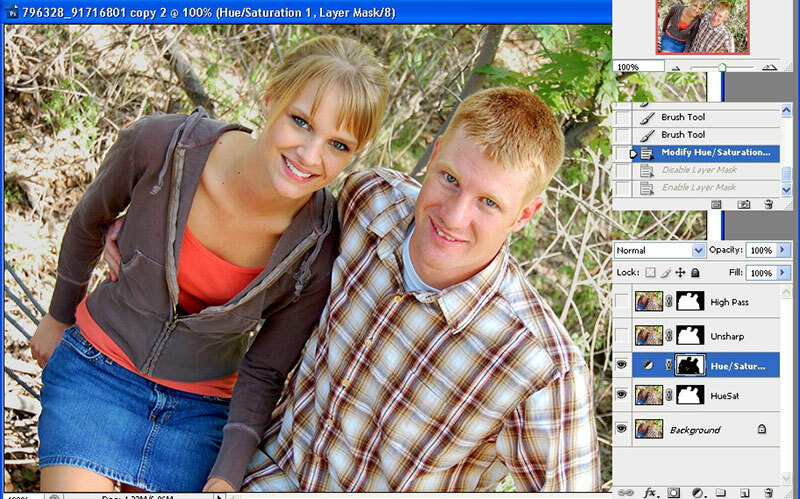 Don’t worry at the moment if it looks a little too sharp, you can always take down the opacity of the layer later on. Click on the layer you named High Pass – not the layer mask – and go to the top options bar and choose Image>Adjustments>Hue/Sat and take the saturation all the way down to -100. Before you move on to the next step, if you see anything weird and wonderful going on with the masking you can take the time to fix it. Still working on the layer – not the mask – go to Filter>Other>High Pass and you can use the same number I have and then change the blend mode of the layer to Overlay. You can lower the opacity of the high pass layer if you want, I’ve left it at 100% for the moment to see what it looks like with a curves adjustment layer. I can go back and take the opacity down later. Click on the Hue/Sat adjustment layer at the top of the layers stack, then click on the ying yang icon at the bottom of the layers palette and choose Curves. I’ve used a preset curves adjustment – Medium Contrast – you can fiddle around till you get something you like. 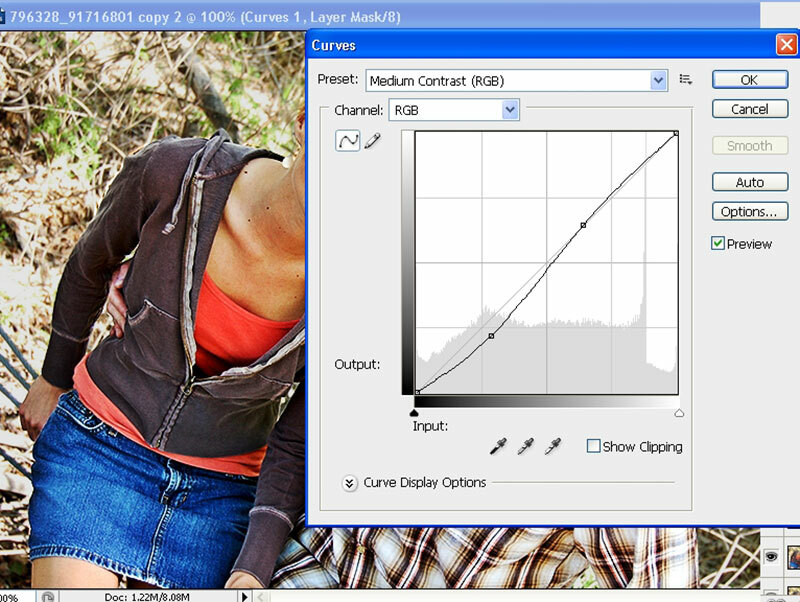 I’m going to take the opacity of the curves adjustment down to 50%.